For generations Ocracokers have entertained each other with stories of ghosts, spirits, and unusual apparitions that haunt our island. 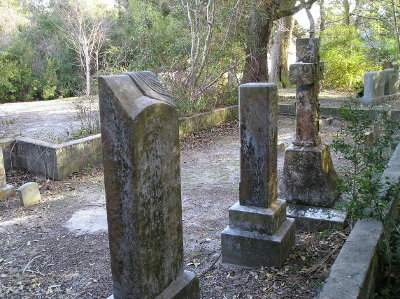 With upwards of 80 identified cemeteries scattered throughout the village, it is fair to say that there are more of the dead than the living on Ocracoke Island. Now you can join native islanders and accomplished storytellers on one of our popular Ghost & History Tours. We offer two distinct tours that include tales of mysterious events at sea, ghosts who prowl our graveyards, and spirits that haunt hotels, cottages, and village paths. Along the way we share fascinating island history. Your tour guides include Philip Howard, 8th generation islander and local historian, his daughter Amy Howard, manager of Village Craftsmen on Howard Street, and David Tweedie (aka “Fiddler Dave”) of Molasses Creek. When dark descends on Ocracoke, don’t look over your shoulder! Tours begin at Village Craftsmen on Howard Street and reservations are recommended. Call (252) 928-5541 between 10 am & 4 pm…or sign up at Village Craftsmen.